US doo-wop group from Harlem, New York, active between 1953 and 1962. Originally known as "The Carnations". Members: Earl Carroll (lead vocalist), Bobby Phillips, Lavern Drake (bass vocalist), and Gus Willingham, James "Poppa" Clark. Later: Earl Wade and Charles Brooks. 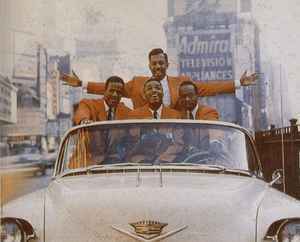 In 1957, the group split: one group was initially known as "The Four Cadillacs", with current bass J. R. Bailey, former bass Lavern Drake, and new members Roland Martinez and Bobby Spencer. This group included former group saxophonist Jesse "Tex" Powell and recorded in early 1958 as "Jesse Powell and the Caddys". The other four current members - Carroll, Wade, Brooks, and Phillips - continued recording separately, later as Earl Carroll and the Cadillacs. Later in 1958, the groups combined back into one. Carroll's backup vocalists, Wade, Brooks, and Phillips, all decided to retire and Carroll joined Bailey, Drake, Martinez and Spencer. Carroll's lead spot had been given to Spencer and Bailey, and he left shortly thereafter, creating a new group, Speedoo And The Pearls, which recorded briefly in 1959. Revived in the early 1990s by Earl Carroll with Bobby Phillips, Steven Brown, Gary K. Lewis, and musical director Eddie Jones. Brown left in 2003. Phillips died in March 2011. Eddie Jones died in 2008.